Radical shoe designs from Israeli artists captivate viewers. Many of us are familiar with Israeli-made footwear we can buy in U.S. stores and online — comfortable, attractive items from Naot, Beautifeel, Jafa, Dafna Shoes, TamarShalem and others. 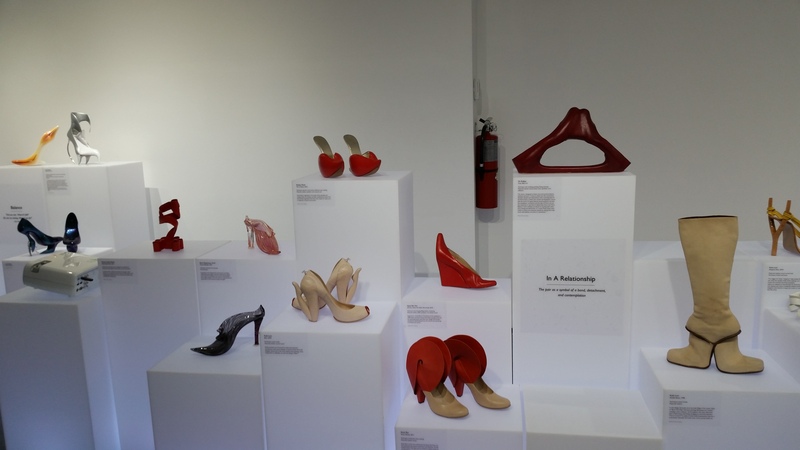 But this week I saw an array of shoes like no other − fascinating footwear created by alumni and students of the prestigious Bezalel Academy of Arts and Design in Jerusalem (founded in 1906). “Walk of Art: Visionary Shoes” runs until Feb. 13 at the Parasol Projects Gallery at 208 Bowery in New York. The question of whether these shoes are works of art, as the wall text asks, didn’t phase me. I just enjoyed the show. Often defying space, gravity and anatomy, the 60 radical designs were created using traditional and unconventional materials including leather, aluminum, wood, glass, cow bone, ceramics, polycarbonate, fiberglass, brass thread and cork. A few are 3D printed. The exhibition is organized around nine themes ranging from “Natura Morta,” reflecting on the ephemeral, which includes Sigalit Landau’s shoes that were suspended in the Dead Sea until they were crystallized, to “Balance,” which shows Aya Feldman’s far-out shoes inspired by musings about life beyond Earth. Others are influenced by various artists and art movements: Salvador Dali, Anish Kapoor, Cubism, Bauhaus and Rococco. Some reflect biblical and historical themes. Kobi Levi’s “Slingshot Shoe” incorporates a wood and leather slingshot reminding us of the one David used to kill Goliath. I hope this exhibition travels. Preferably not on its feet.